The Legal Genealogist, in case you hadn’t noticed, loves law books. Any kind of law books. Court record books. Law dictionaries. Legal treatises. And most of all, the statute books. The session law books. The day-to-day things that our legislators did for — or to — our ancestors. And as one with Kentucky roots — my Bakers, Fores, and Cottrells all spent time in the Bluegrass State — and as one looking forward to spending some time there this weekend at the Family History Seminar and Book Fair sponsored by the Louisville Genealogical Society — it’s been a blast playing in the Kentucky statute books. And even in the unofficial versions of the state laws, the stories that come out in the private laws are just wonderful. Private laws, remember, are laws passed not because the Legislature was trying to address some broad issue (like taxation or roads or voting eligibility) but to address some individual or family concern.3 The usual title of a private law, or at least a common one, was “An act for the relief of” the person or persons the law was intended to benefit. These exist for the federal government and for the states as well. And looking just at the last of four volumes in an 1814 set edited by William Littell covering just the period from December 1808 through February 1812, the pages of The Statute Law of Kentucky are full of private laws. 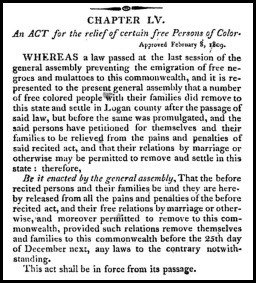 An ACT for the relief of certain free Persons of Color. Approved February 8, 1809. There are stories told in the law books, and none more compelling than in those private laws. Don’t overlook them! Most early session law books have been digitized, and that means they should be word-searchable on one of the three big digitized services, Google Books, Internet Archive or HathiTrust. Always worth entering a name to see what pops up! Thank you, Judy! Searching in Google Books, I found records of a lawsuit in 1907 where my great-great-grandfather’s second wife successfully sued for damages after a telephone company’s negligence (low-hanging wire) caused her horse to rear and flip over her buggy. The concussion and other injuries sustained appeared to be the types that would have affected her the rest of her life and may help explain why she predeceased her much older husband. I Love the statute books. Before many were digitized, our high judge allowed me to bring home (borrow) over 50 of them of the oldest days. Thankfully, we are a historical area and the Courts have kept most of these old gems. I have transcribed data from many of them as it pertained to this area but want to go back through the digitized versions and pull more. I knew what the “for benefit of” meant but had never attached a “title” to it – private laws. I encourage researchers to go thru these. There are also, of course, divorces handled by the state legislature, name changes, etc.